Following in the footsteps of GroupMe, another startup born at a Disrupt Hackathon is moving on to becoming areal company. Last May, Docracy was one of our Hackathon winners, and now it’s raised a $650,000 seed round led by First Round Capital. Vaizra Investments, Rick Webb and Quotidian Ventures also participated. 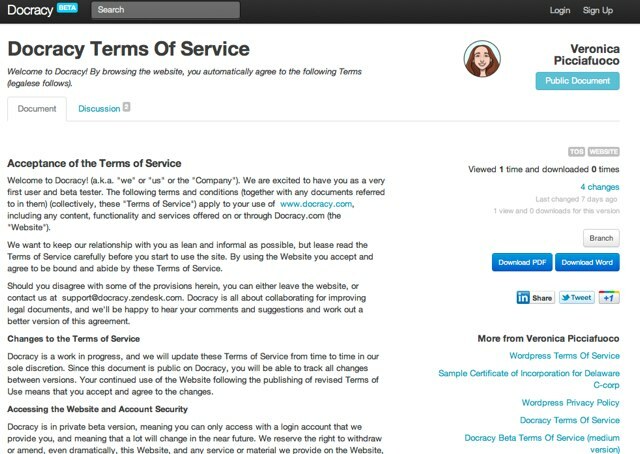 When Docracy launches publicly, it will be a repository for legal and business documents such as NDAs and term sheets. Anyone will be able to upload a document, which will be translated into native HTML5. The documents can be redlined, shared, and even signed. The more a document is signed, the more social proof it gathers that it is a well-accepted document. Founders Matt Hall And John Watkinson were frustrated with how hard it is to find standard business documents online they could trust. They want Docracy to be “a place for documents to live and be discussed,” says Hall, so that people can figure out if it is the right document for them. The usage stats will be key here. Once you find a doc you like, you can edit it to suit your particular needs. Here is a sample doc. It is time ro liberate documents from PDF and .doc files.